Today will the most epic of all days in terms of total miles rode. I knew I’d be riding far today. 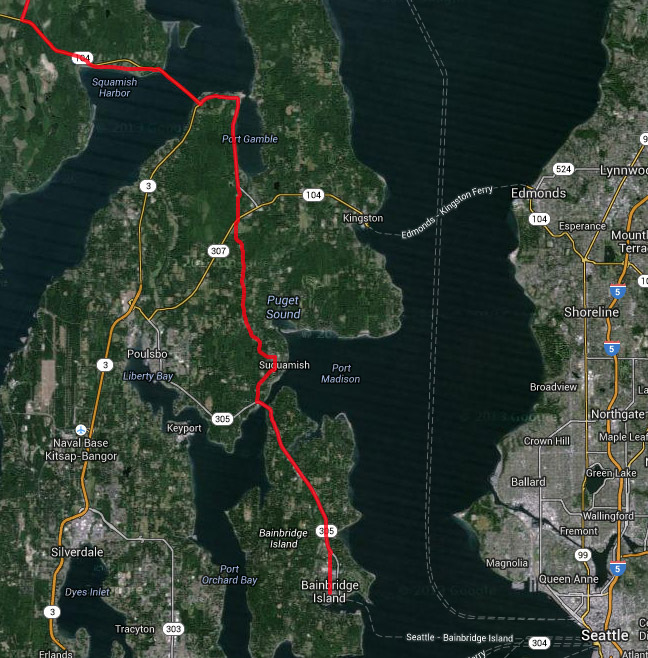 But I also suspected I might jump on a bus before Bainbridge Island and shave off a dozen miles or so. As it turns out, I didn’t do that. I rode 72 total miles fully loaded today. In retrospect, I’m in a bit of awe at myself for having accomplished this without major cramps or sickness. 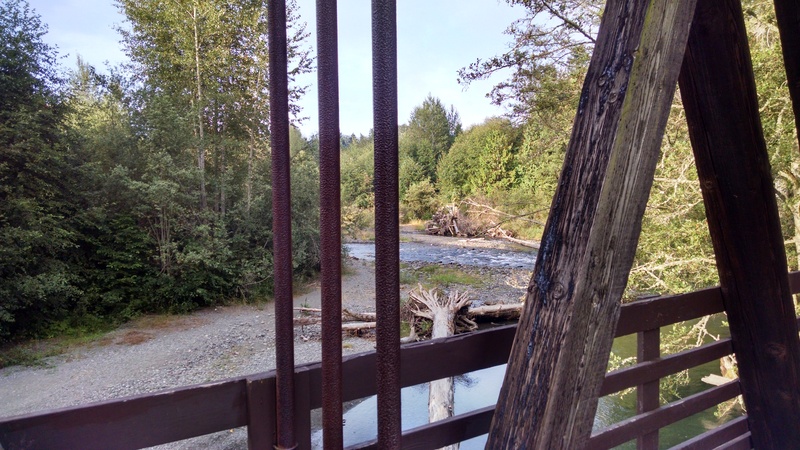 Starting out, I have to take a couple of miles of road to get back to the Olympic Discover Trail (ODT). And I’m immediately pondering the thought of where I’m going to end up sleeping tonight, and how far exactly I’m going to go before deciding to jump on a bus. But I’m thankful that there is still many miles of ODT that really is path to start my day out. 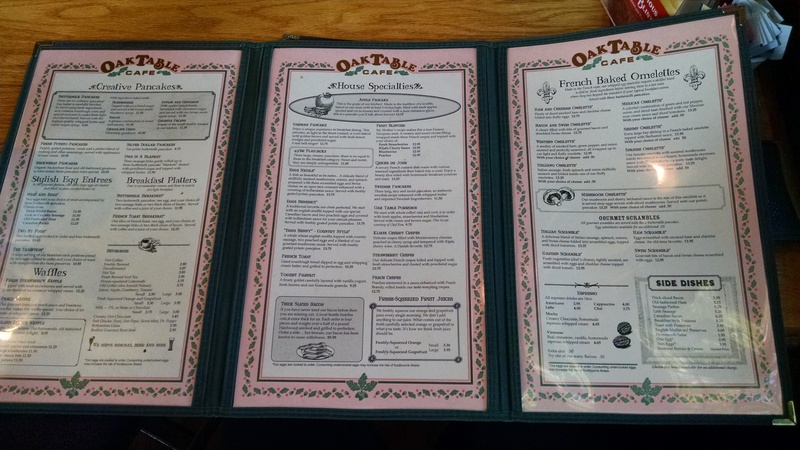 A slight detour from the ODT takes me over to the Oak Table Cafe in Sequim, where their breakfast menu is a three page foldout. It was good that I asked a local jogger for a place to eat. 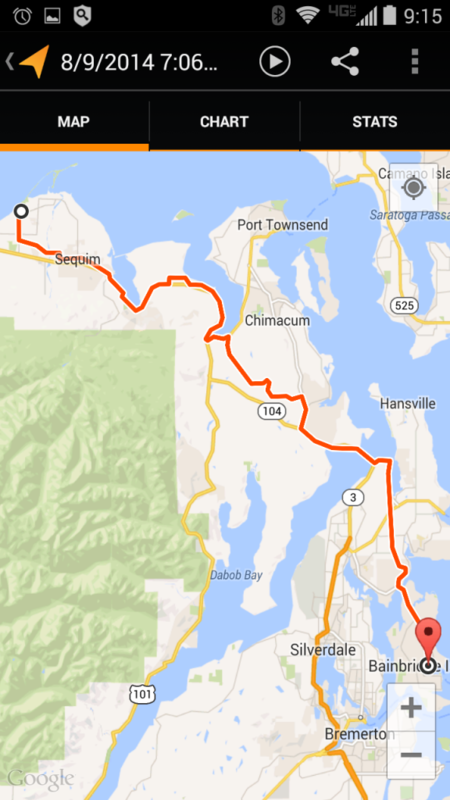 Sequim was not directly in the path of the ODT, so knowing about the detour was good. 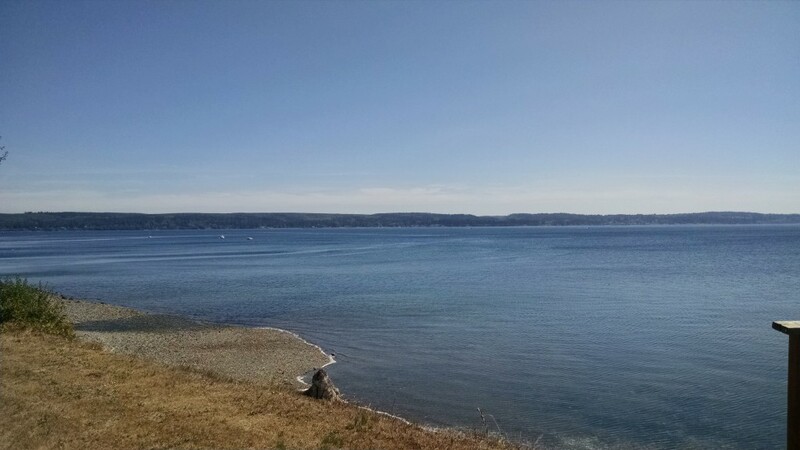 I fuel up, and charge up my phone, and do some quick investigating for places to stay on Bainbridge Island. And again I come up empty handed. I leave the Oak Tree Cafe still not knowing where I will end up tonight. But at least I’m energized and ready to ride. 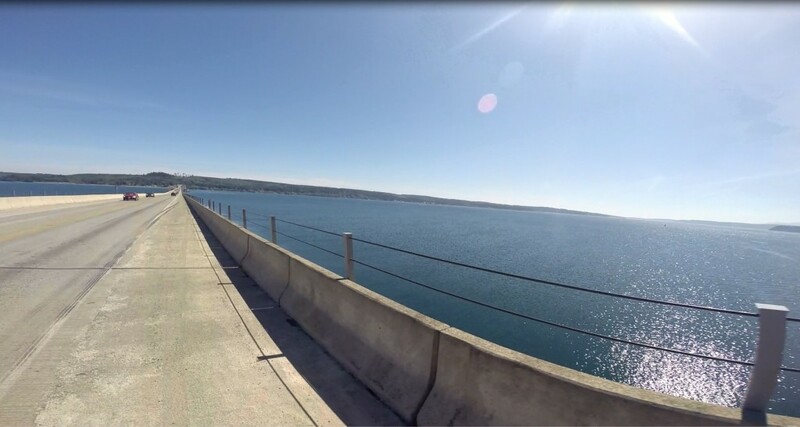 After about thirteen miles I reach Sequim Bay Park and Sequim Bay, Google’s navigator wants me to get onto the 101, but there’s no easy way to do so. The ODT seems to keep going through a park. And I mention this only because when I reach the next bay, Discovery Bay maybe ten miles later, the exact opposite happens. Google directs me to follow the ODT which has it’s very own bike path curving around the bay on top of the sandy beach area. If it was possible, it would have been a fantastic route to take. But as I looked out over the bay, I could see that the path was impassible and that the bridge out there was falling apart or undergoing construction/improvement. You can see the gray outline of the ODT, which seems to be in disrepair. It turns out just fine as there’s a little cafe on the 101 where I stop to charge up again and eat some lunch. Again I do some investigating for available places to sleep after eating, and *again* I come up empty handed. One sympathetic person working at a hotel says in a compelling sad voice “good luck”. I can hear it in her voice. 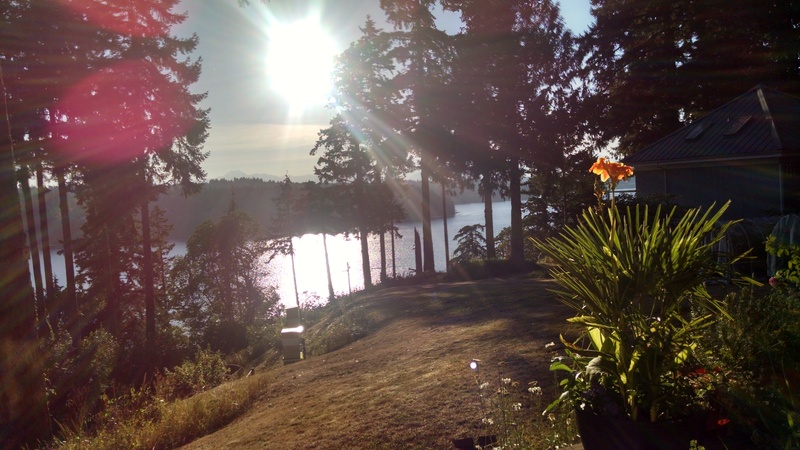 No amount of luck is going to make a place available on Bainbridge Island at this time of year on such short notice. I leave the cafe still with no idea where I will stay this evening. As I pass Uncas Road, I see this small little shack that looks like a coffee shop, and I find it interesting that there’s a line of about 20 people standing and waiting to be served. I almost stopped to get a coffee because I was thinking that must be some *really* freaking good coffee for a line to be that long. But then I saw the sign that read cannabis and I decide that perhaps since it’s only been legal for a short time that there are only a select few places to actually purchase the stuff in Washington. This must be one of those popular places. 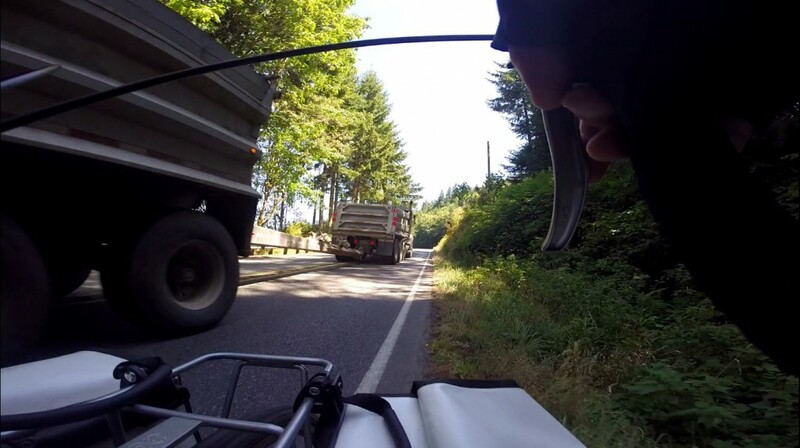 Turning on to a brief stretch of the 20, I ride on a really small or non-existent shoulder next to semi trucks. This is one of the scariest sections of the entire 10 day tour. 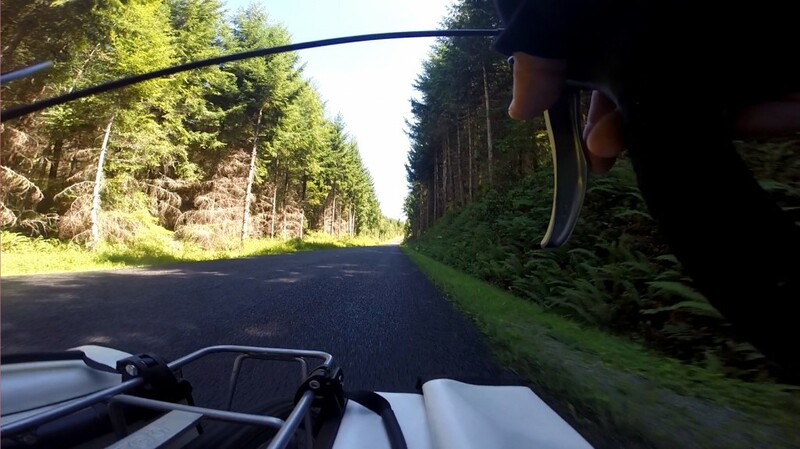 This still picture may not look very scary, but keep in mind that it is steep uphill, and notice the speed limit around the corner is 45mph. That means that I’m going really slow, about 6 to 8 miles per hour, while the cars are pushing 40 to 50 while passing me, including this truck below. The wind from this truck sets me off balance a little. And then, before I know it, I’m turning onto Eaglemount Road and away from the traffic. The Eaglemount Rockery Cotages/Motel on the corner sports a “No Vacancy” sign, reminding me once again that I have nowhere to stay this evening. I brush it off as inconsequential. Roughly ten miles of beautiful riding like this until I reach Beaver Valley Road (the 19). 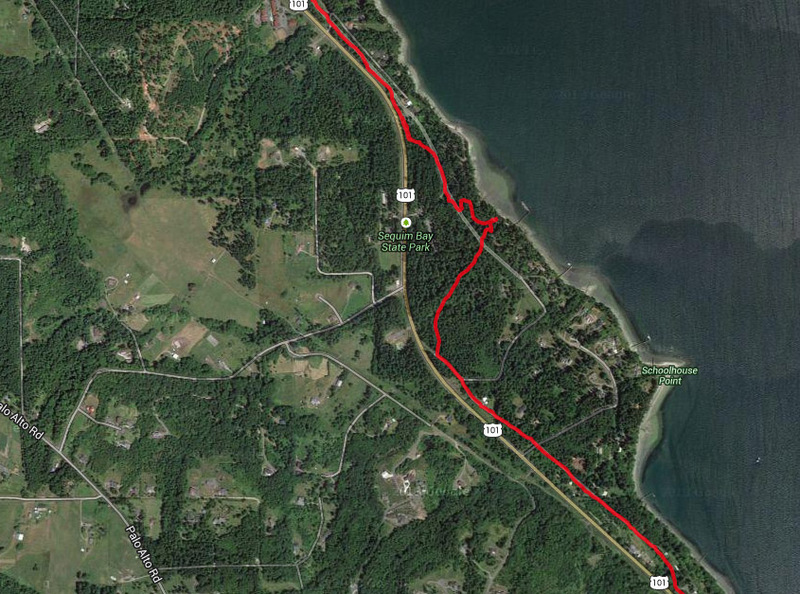 I think I can recall only one car passing me on this entire ten mile stretch. A couple of cyclists passed me going the other way, one of which wondered out loud how I had managed to find this path. Does Google navigator know something special I wonder? There was a sign at the entrance to this road saying it was going to be chipsealed in August. So perhaps I’m one of the lucky first riders post-paved on this road. Score! A few miles later I hit the 104 for some high speed downhill descending toward Squamish Harbor. 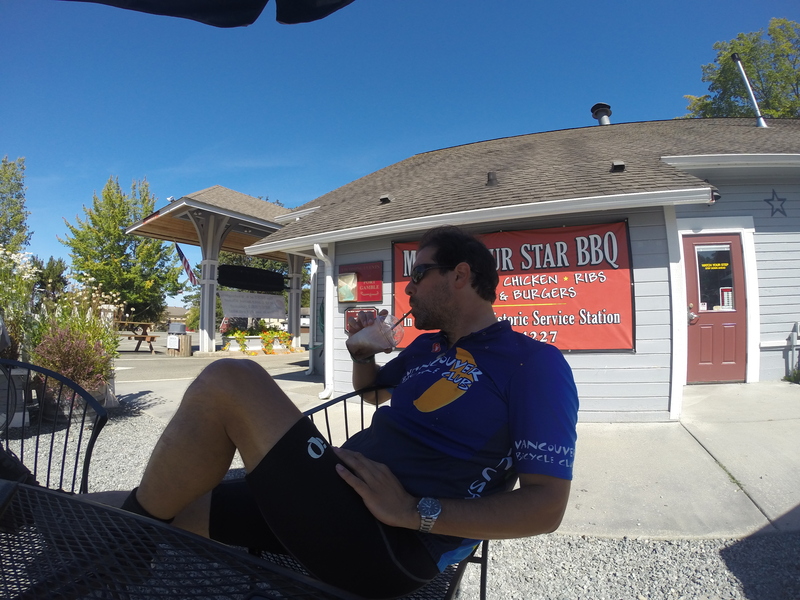 And though my ride is only about 60% complete for the day, I have a sense of nearing my destination as I turn off onto Shine Road along Squamish Harbor. You wouldn’t know it from this picture below, but trust me, Mt Rainier is peeking its head above the other side of the harbor. A likely contributor to my feeling of nearing the end of the journey. 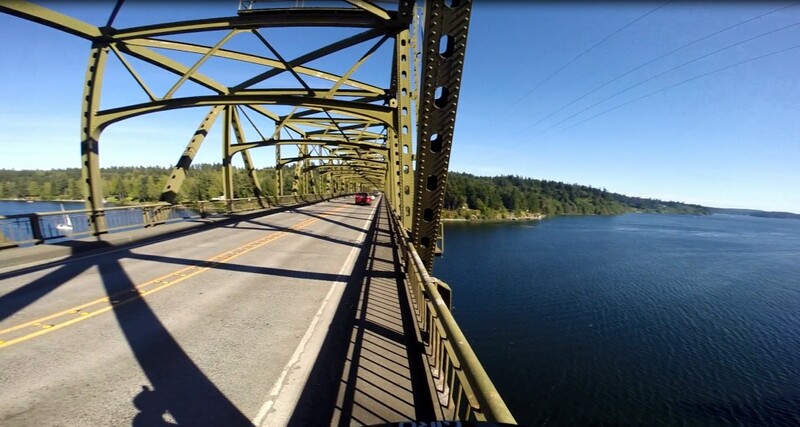 And then there’s the excitement of crossing the Hood Canal Floating Bridge. I’m totally feeling accomplished here, almost as if I’ve completed the ride already. And so, shortly after, I stop off for a treat in Port Gamble. Not too long after this treat, I’m thinking that I’m either on “the island”, or that I will soon be on “the island”. And I’m referring to Bainbridge Island when I’m thinking about the Island. And then I’m remembering that originally, back in the early days of planning that I had considered stopping off at a friend of the families for coffee or dinner. Back in the planning phase, the trip just didn’t seem like it was going to take me anywhere near his place of business. It just didn’t seem like a reasonable possibility during planning. But then I found myself overly excited about a possibility. Maybe this family friend knew of a place I could stay on the island. Maybe he would have a idea for me. And so I pull over and search the maps for his business. At first I’m wondering if it was *another* island further north that his business is on, and perhaps I won’t see his business at all on this Island. And then it pops up. His business is four blocks from the ferry that goes into Seattle, and suddenly I have this surge of hope. The thought that maybe, just maybe I’ll find a solution to where I’m going to stay tonight. Keeping in mind that I haven’t spoke to Mike in maybe two to three years and I’m not even sure I have his phone number, I find his profile on Facebook. The “Call” button is glaring at me and so I press it without thought. I know that sometimes those numbers can be old and very wrong, and the voicemail message I receive isn’t exactly encouraging, but I leave a message anyway explaining my predicament and asking if he knows of any options for me. And then I Facebook message him a similar message in case the number is wrong. And then I text my dad asking to confirm if I’ve got the right number for him from Facebook. Okay, I’ve tried three methods for trying to reach Mike at this point, of which I have no idea how they will turn out. So I jump back on my bike and continue riding the last 15-ish miles of the trip. Not sure why I told Mike I’d be at his place of business in one hour. It took more like two hours to get there in my state of tiredness and slowness. It was a long slow trek into Bainbridge. The Agate Pass Bridge into Bainbridge has a tiny little sidewalk that I choose to ride on instead of riding in the road. And the wind from the cars are blowing me and making me feel a little unstable riding in. But I’m still really excited at this point. It’s “The Island”. Yay! Four blocks from the ferry, I arrive at Mike’s business and ask for him or his wife. I’m informed that they are usually in on the weekday mornings, and not usually around on the weekends. It’s been nearly two hours since I left those messages and texted my dad. And I’ve not got a response from any one of the three messages I had put out there. So I sit and rest on the bench in front of the building where I thought I might see Mike or Alexa, pondering my next move. And as I’m packing up, my cell phone rings with a call from Mike. He lives just four miles from the business and he says he’d be happy to take me in for the evening. Get me a shower, let me use their washer and dryer, and crash on their fold out bed. HA HA! I’m so elated, and feeling a little guilty that I might be imposing on him. And so when he calls me back to arrange meeting I let him know this. But he’s insistent that he won’t turn me away, and he’d be happy to have me. And so I pack up and head the four miles over to his place, which brings my total miles for the day to 72 miles! And here is the view from the house I’m so fortunate to sleep at on my last evening of the Epic Solo Bike Ride. I am in heaven and full of good fortune. That evening, I have dinner with Mike and two of his boys, at the place where his third son actually works. So we’re being waiting on by one of his sons. And a friend of theirs comes up to the table and is telling interesting and hilarious stories to us while we’re waiting for our food, and even when our food arrives. We’re all sitting around the table laughing hysterically at this man who I only just met. And one of the boys friends is eating with us and celebrating that he has just had a new baby sister born the evening before. 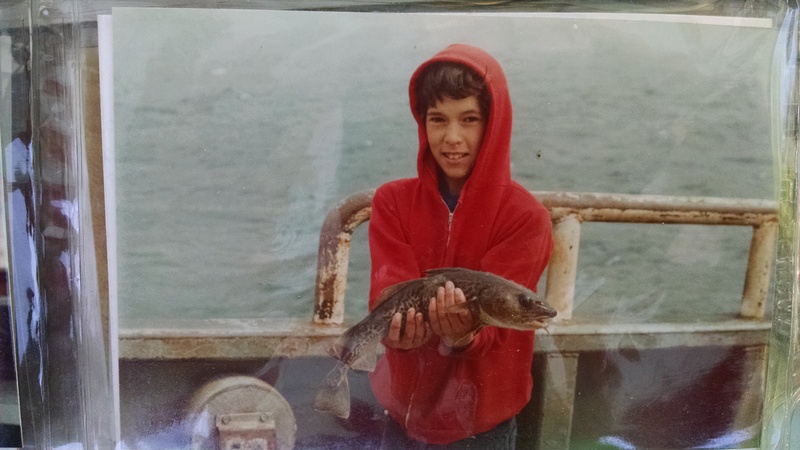 And then Mike pulls out some old photo albums that has pictures of me back from when I was twelve years old, and we were on my dads boat over the summer. It was when Mike first started working for my dad. There were pictures from our time at Prince William Sound, and also pictures from the Alaska Peninsula. I know I was a real pain at that age and I was really annoying to others. Everyone tells me so. 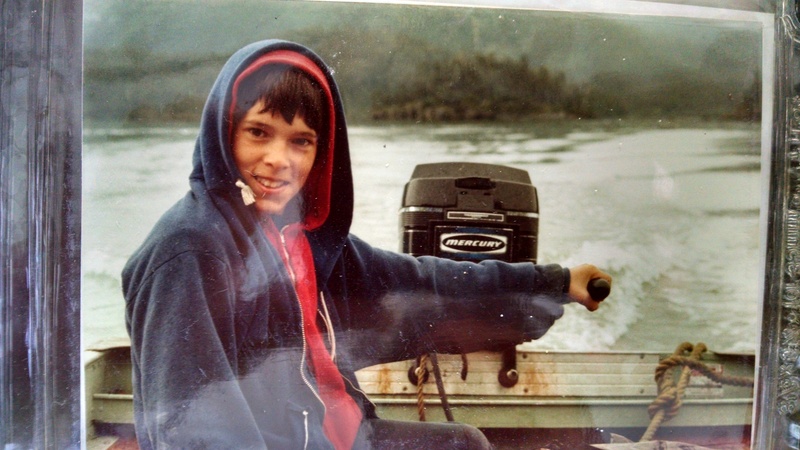 But for me, that summer was one of the most magical times in my life, and it was just a little euphoric to see these old pictures from thirty plus years ago. Despite the fact that I didn’t get to sleep until after 10pm, and I had to wake up before 4am the next morning to get to the ferry in time, it was a very restful evening. 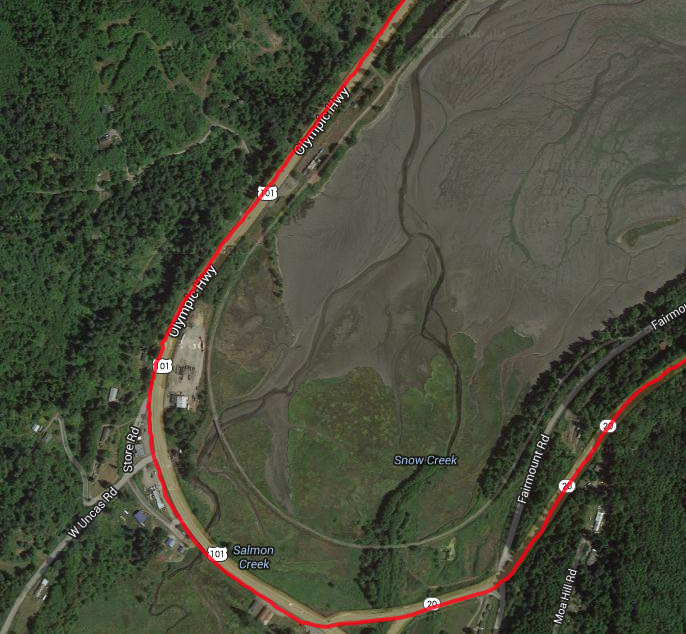 Here is the map for the day 9 ride. For a link to the full GPS detailed route, click here.